Cover Front: RCA and catalog number upper right corner. Formerly available as LSP-3893 lower left corner. RE-4 printed on the lower right corner. Cover Back: RCA and catalog number upper right corner. RE-4 printed on the lower right corner. Disc: (1979) Black label, dog near top. 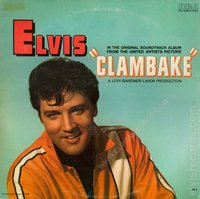 Around March 2011, three sealed copies of AFL1-2565 Clambake were opened to discover that each copy contained the APL1-2565 record and label. 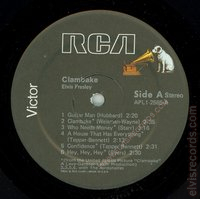 The cover may be found in cardboard with album slic (circa 1979/1980) and thin white cardboard with graphics printed directly to the cardboard (circa 1982/1983)3. 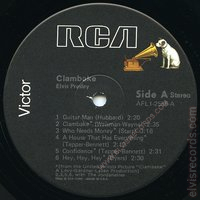 A copy surfaced for sale in August 2012 with the AFL1-2565 catalog number printed on the record and label. A second copy, found in a cardboard album slic with 3/4/1981 written on the inner sleeve, surfaced in January 2013. 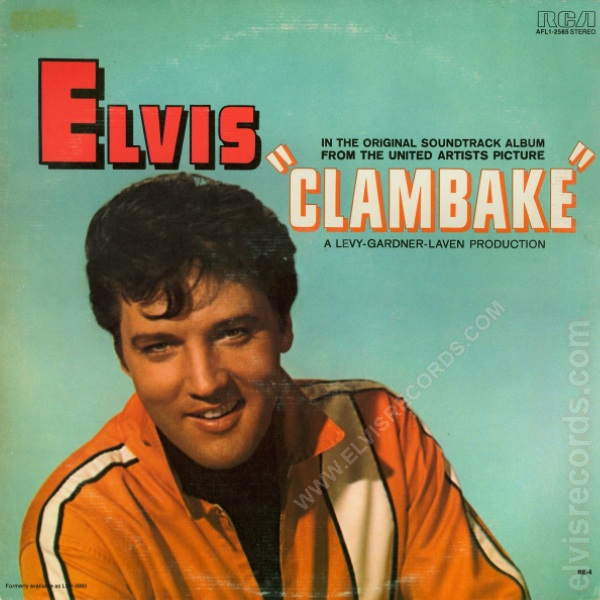 A third copy also found in a cardboard album slic sold on eBay January 17, 2015. Despite what the guides may suggest where the release date for this catalog number is 1977, evidence suggests otherwise. 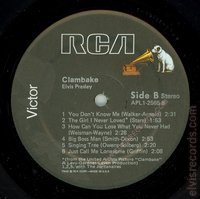 A copy of Clambake with the catalog number beginning with prefix APL1 has an AFL1 sticker on the spine. This suggests that the catalog number was transitioning from the APL1 prefix to the AFL1 prefix. There is a price sticker on the cover, indicating June 1979. 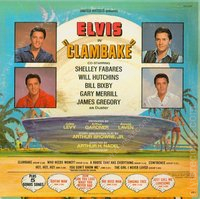 I suggest that the cover printed with AFL1 could have been released to commemorate the death of Elvis or in time for the Christmas season, placing it around 8/1979 or 10/1979, which would fall in line with other releases of this period. 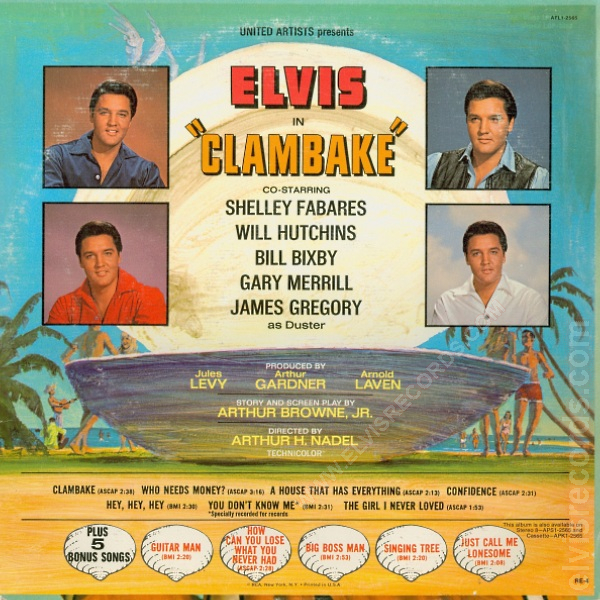 Previously released as APL1-2565 Clambake.